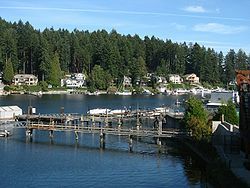 Gig Harbor is the name of both a bay on Puget Sound and a city on its shore in Pierce County, Washington, United States. The population was 6,465 at the 2000 census. Gig Harbor is known as the gateway to the Olympic Peninsula. Due to its close access to several state and city parks, and historic waterfront that includes boutiques and fine dining, it has become a popular tourist destination. Gig Harbor is located along State Route 16, about six miles (10 km) from its origin at Interstate 5, over the Tacoma Narrows Bridge. A 1.2 billion dollar project to add a second span to the bridge was recently completed. During off-peak traffic times, Tacoma can be reached in 20 minutes and Seattle in less than an hour. Based on per capita income, Gig Harbor ranks 49th of 522 areas in the state of Washington to be ranked. During a heavy storm in 1840, Captain Charles Wilkes brought the Captain’s gig (small boat) into the harbor for protection. Later, with the publication of Wilkes 1841 Map of the Oregon Territory, he named the sheltered bay Gig Harbor. 1867 brought fisherman Samuel Jerisich to the Gig Harbor area, along with many other immigrants from Sweden, Norway, and Croatia. Gig Harbor was officially incorporated on July 12, 1946. Commercial fishing, boat building, and logging dominated the economy until the construction of the first Tacoma Narrows Bridge in 1940. Until then, the primary method of transportation between Gig Harbor and the economic center of nearby Tacoma was by steamship. Starting in 1836 steamships started plying the waters of Puget Sound and quickly developed into what was eventually dubbed “The Mosquito Fleet.” Gig Harbor, isolated from Tacoma and Seattle by Puget Sound and the Tacoma Narrows, could not be reached by automobile or horseback except via a very long and arduous trip south around Puget Sound and Hammersly Inlet. Unfortunately, the boom was to be short lived as the first bridge collapsed just months after it was completed. The resource demands of World War II prevented another bridge from being built until 1950. Between the time when the first bridge collapsed and when the second bridge was completed, a state run ferry service delivered drivers directly into downtown Gig Harbor. Remains of the ferry dock can still be seen just outside the mouth of the harbor at the Southeast end of Harborview Drive. The area has been turned into a small park where the public can see a panoramic view of the Cascade Mountains, Pt. Defiance, and Mt. Rainier. After the completion of the replacement bridge in 1950, Gig Harbor and the surrounding area quickly began to develop as a suburb of neighboring Tacoma. First the area saw substantial residential development as families retreated from Tacoma in favor of the tree-lined neighborhoods and waterfront lots available on the Gig Harbor Peninsula. What had once been summer cabins became primary residences for people who commuted daily over the bridge to Tacoma. Medium sized housing development sprang up across the peninsula. The 1980s and 1990’s saw substantial retail development near State Route 16 to service the growing residential population, shifting the economic center of Gig Harbor out of downtown. For some time, city leaders were unsure how to handle the growth while maintaining the character of the city. Ultimately, the city decided to aggressively annex the surrounding rural areas and convert them into high-density commercial and housing districts, forever changing the rural character of the area but assuring that little new development happens in the historic downtown area, preserving its history and charm. By the 1970s, local merchants had begun actively promoting the downtown area for its historic value, and tourism became prominent on the list of economic engines in Gig Harbor. Today, downtown Gig Harbor is a very active place for tourists with shopping, dining, and recreation on every block. The last large swath of undeveloped waterfront property at the South end of downtown, was recently developed into the headquarters of the Russell Foundation, named for George Russell, founder of Russell Financial. Today, despite a long history of boat building, very little manufacturing exists in Gig Harbor. The only remaining boatbuilder in Gig Harbor is Gig Harbor Boatworks, which builds rowing and sailing dinghies in classic style using modern materials. Until recently, Tiderunner Boats maintained a manufacturing facility at the North end of the bay. The historic Skansie boatyard is now primarily a maintenance facility for yachts and pleasure craft. The Glein/Eddon/Gig Harbor boatyard was recently purchased by the city after spending many years sitting idle. The city intends to use it as a working waterfront museum. Commercial fishing is still of great cultural, if somewhat lesser economic, importance to Gig Harbor, and many commercial fishing boats make Gig Harbor their home port. Most, however, do not rely on Puget Sound to gather their catch, rather, finding it more profitable to venture north to Alaska to fish in the Summer. Gig Harbor’s fishing fleet still gathers the first weekend in June (during the Maritime Gig Festival) in the center of the bay for the annual Blessing of the Fleet ceremony. In recent years, due to the dwindling number of remaining fishing boats, pleasure craft have been allowed to participate in the ceremony, somewhat lessening its authenticity, but increasing its visibility and participation. A new Tacoma Narrows Bridge has been built alongside the existing bridge and opened July 2007, doubling past capacity. With it will come new economic challenges and benefits for the city of Gig Harbor and the surrounding community. Jerisich Park, combined with the adjacent Skansie Brothers Park, is a large, open, waterfront space with grass, decks, benches, and a covered Pavilion for community events. It is also home to the Fisherman Memorial. This large bronze statue, which depicts a fisherman hauling in his catch, was commissioned in memory of Gig Harbor’s fishermen, with special gratitude to those who lost their lives at sea. The parks often play host to fairs and events ranging from the annual Holiday tree lighting ceremony and Blessing of the Fleet, to musical concerts and art festivals. There is also a public use moorage dock where boaters can stay, free of charge, for a limited time. At the mouth of the harbor a short sand spit is open to the public and is the site of a red navigational hazard light built into a miniature lighthouse model. The beach is public, but access is difficult and parking is limited. Gig Harbor City Park (aka Crescent Creek Park) offers a variety of activities, and is especially geared toward larger groups and families. A children’s play area features modern equipment to climb and play on, as well as swings for infants. The park also offers a baseball diamond in the upper area of the park, a basketball court and tennis courts. GH City Park is adjacent to a stream as well and has teaching plaques on stream conservation. A field in the lower part of the park offers picnic benches and recreational area for informal games and sports. There is a large wooden picnic shelter with fresh water and wood stoves. The park is popular in the summer for family reunions, picnics, and group gatherings. Gig Harbor is located at 47°19′37″N 122°35′11″W﻿ / ﻿47.327032°N 122.586426°W﻿ / 47.327032; -122.586426 (47.327032, -122.586426). According to the United States Census Bureau, the city has a total area of 4.4 square miles (11.3 km2), all of it land. The Peninsula School District is the district covering the city of Gig Harbor and the Peninsula. As of the census of 2000, there were 6,465 people, 2,880 households, and 1,765 families residing in the city. The population density was 1,485.2 people per square mile (573.8/km2). There were 3,085 housing units at an average density of 708.7/sq mi (273.8/km2). The racial makeup of the city was 94.17% White, 1.11% African American, 0.63% Native American, 1.53% Asian, 0.22% Pacific Islander, 0.54% from other races, and 1.79% from two or more races. Hispanic or Latino of any race were 3.03% of the population. There were 2,880 households out of which 25.1% had children under the age of 18 living with them, 50.0% were married couples living together, 9.0% had a female householder with no husband present, and 38.7% were non-families. 33.2% of all households were made up of individuals and 16.4% had someone living alone who was 65 years of age or older. The average household size was 2.16 and the average family size was 2.75. In the city the population was spread out with 20.3% under the age of 18, 7.1% from 18 to 24, 23.5% from 25 to 44, 25.7% from 45 to 64, and 23.4% who were 65 years of age or older. The median age was 45 years. For every 100 females there were 83.4 males. For every 100 females age 18 and over, there were 78.9 males. The median income for a household in the city was $43,456, and the median income for a family was $57,587. Males had a median income of $46,250 versus $28,487 for females. The per capita income for the city was $28,318. About 3.5% of families and 5.9% of the population were below the poverty line, including 7.8% of those under the age of 18 and 4.1% of those ages 65 or older. 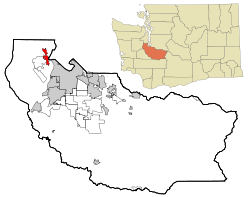 At the state level, Gig Harbor is part of the 26th Legislative District – which runs from the Tacoma Narrows in the south to Bremerton in the north. It is represented in the Washington State Legislature by Senator Derek Kilmer (D – Gig Harbor), Representative Jan Angel (R – Port Orchard) and Representative Larry Seaquist (D – Gig Harbor). At the congressional level, Gig Harbor is part of Washington’s 6th Congressional District. It is represented by Congressman Norm Dicks and Senators Patty Murray and Maria Cantwell. Jay Faerber, comic book writer. Scenes from Enough, starring Jennifer Lopez, were filmed in various locations around Gig Harbor. ^ a b “American FactFinder”. United States Census Bureau. http://factfinder.census.gov. Retrieved 2008-01-31. ^ “US Board on Geographic Names”. United States Geological Survey. 2007-10-25. http://geonames.usgs.gov. Retrieved 2008-01-31. ^ “US Gazetteer files: 2000 and 1990”. United States Census Bureau. 2005-05-03. http://www.census.gov/geo/www/gazetteer/gazette.html. Retrieved 2008-01-31. ^ Faerber’s place of residence is given in the “About Jay” sidebar on his Blogspot page.